Let sit out for 5-10 minutes before serving. Top with fresh coco whipped cream, chocolate shavings, coconut flakes, culinary roses and a cherry. Process the almonds and dates until if forms a loose dough. Press between your fingers to make sure it sticks together. Add more dates or nuts for the needed consistency. Pop in freezer while you make the filling. Combine all ingredients (except cherries) in a blender or food processor. Blend until really creamy and smooth. Pour on top of crust to the halfway mark. Pop back in freezer, while you prepare the cherry filling. Place the cherries in the remaining filling, blend until creamy and smooth. Pour cherry filling on top of vanilla layer. You will need a large bowl, hand beaters or a stand mixer. Chill bowl and beaters in freezer for 15 minutes. Turn can upside down and open the bottom end. Pour out liquid and save for another recipe. Scoop out the solidified coconut and place in chilled bowl. Whip the coconut cream for 3 to 5 minutes, until it’s fluffy and light Mix in sweetener, salt and vanilla, whip for another minute. 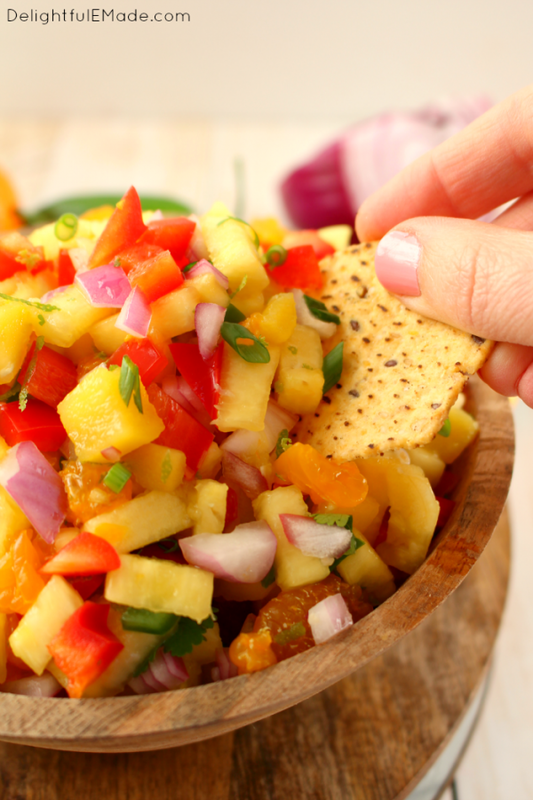 Fresh, healthy flavors of the tropics are paired with peppers and onions for the most amazing sweet, crunchy salsa! Perfect for topping fish or chicken, and great for eating with chips! In a mixing bowl, add the pineapple, mango, pepper, oranges, onions and stir to incorporate. Add the lime juice, zest, vinegar and chopped cilantro and toss. Enjoy right away. Watch this video and try to implement it this week. If you take this challenge, please comment on how it went for you.